After years of deciphering labels for friends, Andrea Donsky realized that there was a big need to get this information out to a much broader audience and eventually launched Naturally Savvy, a very popular website that helps people understand the food that they are putting into their bodies. Yet, the website was just the beginning. Soon thereafter, Andrea, a Registered Holistic Nutritionist, co-authored Unjunk Your Junk Food: Healthy Alternatives to Conventional Snacks and created The Scary Seven, a list of ingredients to avoid. Most recently, she debuted two e-books: Label Lessons: Your Guide to a Healthy Shopping Cart and Label Lessons: Unjunk Your Kid’s Lunch Box. 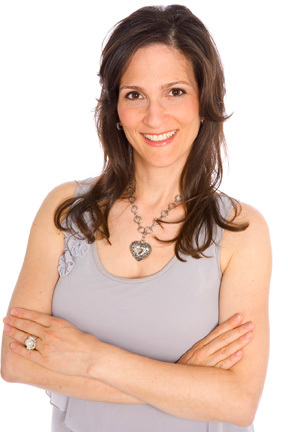 This incredibly busy and prolific healthy living educator has also appeared on major media outlets such as NBC, ABC, CBS, Fox, SiriusXM’s Martha Stewart, and Oprah Radio. I caught with my friend the other day and asked her about one of her favorite healthy habits…juicing. Tell me about your juicing lifestyle? My juicing started many years ago when I was studying to be a nutritionist and learned about its benefits. Now, I love juicing in the summer best because I can walk outside, grab a handful of greens and kale from the garden, and juice them on the spot. There is nothing better than a fresh glass of green juice made within 5 minutes of picking the vegetables. How has your juicing evolved over the years? I would say the biggest change in my juicing habit has been transitioning from juicing mostly fruits to juicing mostly veggies. I used to love juicing apples and pears, but now I primarily use spinach, kale, carrots, and celery. What kind of juicer do you have at home and how often do you make it? I use a Vitamix and love it. The clean-up is super easy, and it allows me to make myself quick and easy smoothies. When you’re on the road for business, do you have a favorite place to get pressed organic juice? Yes! One Lucky Duck in NYC. They have delicious juices that keep me full for a long time. Don’t stop! The more you juice, the more you will love and crave it. If you find you don’t have the time to make it at home, look into local delivery options and keep Max’s Pressed Organic Juice Directory on hand for when you’re looking for a good quality pressed juice. Lastly, what are your best tips for staying healthy when traveling? I carry products with me that I use on a regular basis like xylitol, stevia, and packaged oatmeal for when I’m in need of some protein. I always seek out a healthy grocery store like Whole Foods and end up shopping there many times during my stay. Thanks so much, Andrea! Be sure to visit Andrea at Naturally Savvy or on Facebook.